There are hero products, those that generate all the headlines for a company, and then there are saviour products, those that generate all the revenue. While it may be premature to place the BlackBerry Q5 in the latter category, it’s clear that this is the company’s first device from the BB10 family aimed at the middle, a pared-down and significantly less expensive version of its Q10 flagship. BlackBerry might be putting itself up for sale, but until such a time the company needs to sell smartphones. The Q5, available in Canada for between $350 and $450 outright, is a perfect product to herald the new 2-year contract era. Its price is low enough for parents to pick one up for their kids returning to school, or for companies to buy hundreds to distribute to their office drones. But is it worth your hard-earned money? Let’s take a look. 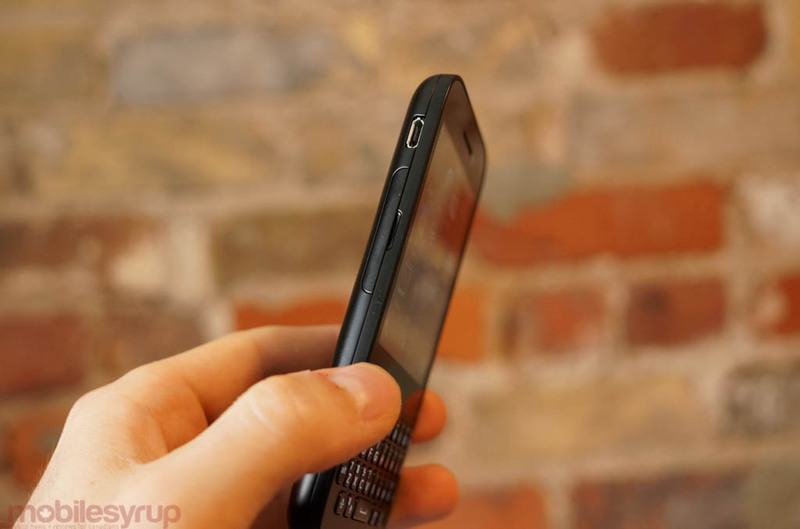 The BlackBerry Q5, above all, does not feel cheap. The company could have gone the route of the older Curve series and dumbed down the phone, but instead it exists comfortably in the mid-range, and that’s where it will likely do well. The ring around the device is glossy and slippery, and is likely the worst feature of an otherwise well-designed smartphone. The chiclet keyboard doesn’t match up to the Q10 — it’s louder and not as comfortable for long typing sessions — but it’s still far better than any Curve keyboard. 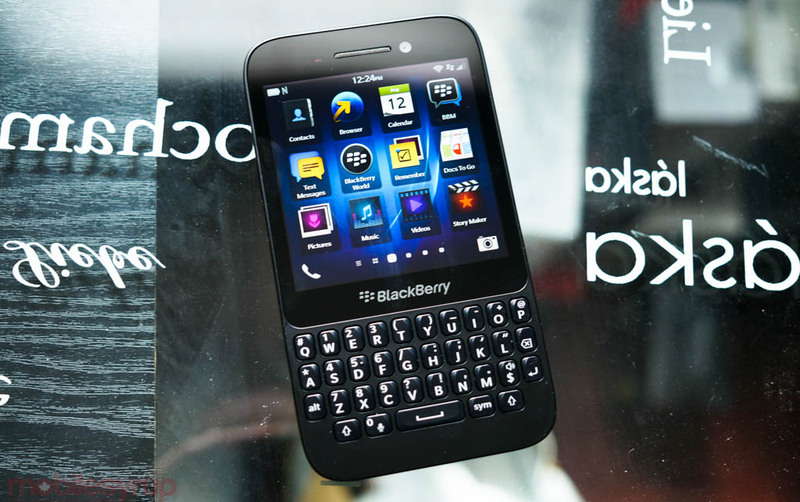 The screen, too, is a marvel for a device such as this; its 720×720 pixel resolution is the same as the much more expensive Q10, and retains similar qualities. Colours are slightly more washed out, and viewing angles are faintly narrower, but it is one of the best screens you can get in this price range. The touch response is also excellent, owed partly to the operating system itself and to the excellent digitizer included in the screen. Taller, thinner and more youthful than the Q10, the Q5 has grown on me the more I use it. It’s obvious where BlackBerry saved money on the phone when you operate the side volume or top power buttons, but elsewhere little has changed in terms of usability from the Q10. 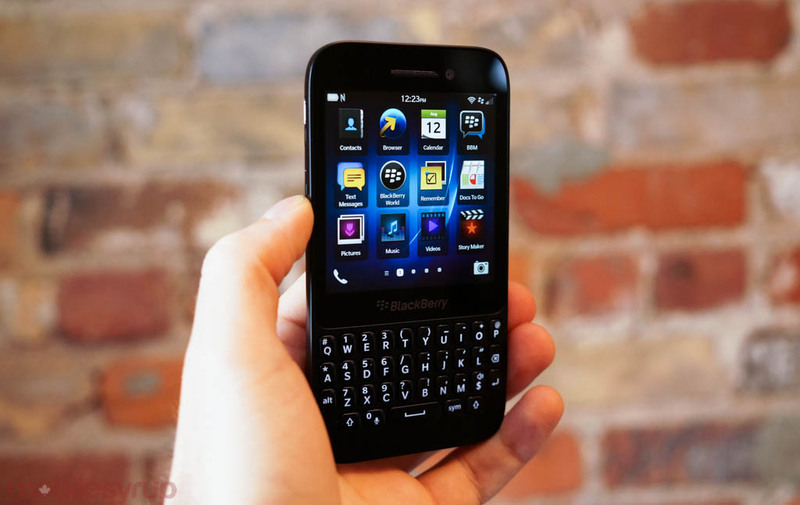 BlackBerry 10.1 is included in the device, and it should receive 10.2 in the coming weeks. Because the keyboard can be used to activate a number of shortcuts from both the homescreen and the Hub, I found operating the device primarily for messaging and social media to be more enjoyable than with the Z10. The red blinking LED is present right above the display, and there is a spaciousness that isn’t present on the Q10 or Z10. There is a feline grace to the Q5 which I appreciate. I found battery life to be pretty exceptional, lasting all day and then some, even with constant push notifications from email, texts and other apps. Performance has been improved in BlackBerry 10.1 over the original release, and I noticed little difference between the Q5 and slightly faster processor in the Q10. BlackBerry 10 is still a powerful, attractive and responsive operating system, but it lacks for the big-time apps that many users want. More importantly, the apps that are there, like Windows Phone, are rarely updated and feel incomplete or rushed. There are some notable standouts, like the New York Times, Cineplex, Facebook, Twitter and Foursquare, but many of the app gaps are being filled by independent developers who either don’t have access to the necessary APIs to replicate full functionality, or lack the coding experience with BlackBerry’s Cascades SDK. Of course, there is always the option of sideloading Android apps to the Q5, most of which were never meant to be used on a display this small with a 1:1 aspect ratio, but it’s more of a hack than a feature. Many notable apps, Skype for example, are ports of Android versions, and while they work just fine they lack the same API access as native apps. 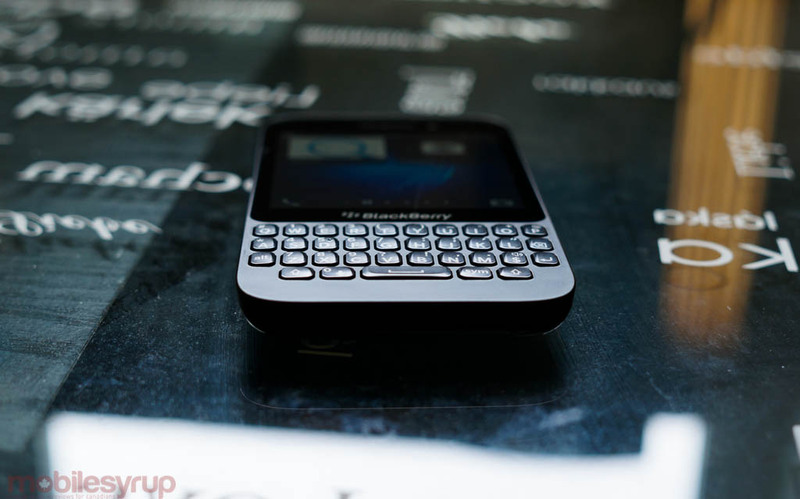 At the end of the day, the Q5 is a capable smartphone, with great battery life, a clicky, responsive keyboard, typically fantastic BlackBerry sound quality, both from the headpiece and bottom speaker, decent performance, a modicum of good apps, and the excellent BlackBerry Hub, which consolidates your social accounts with emails and texts. 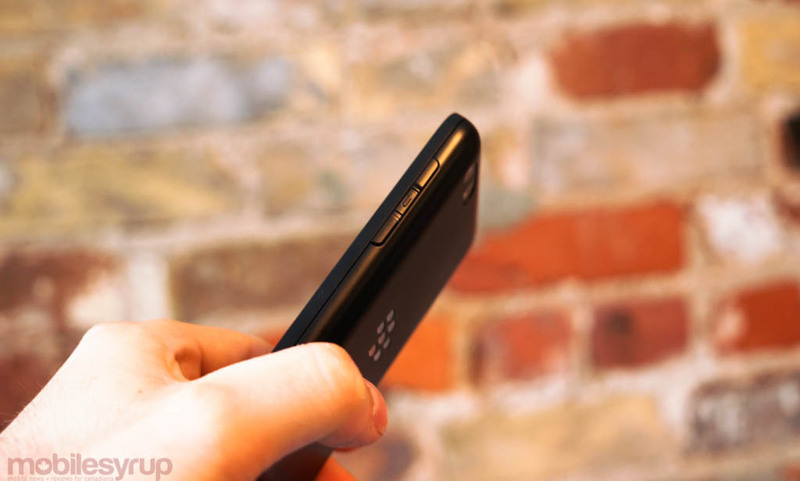 For a more broad look at BlackBerry 10, read our extensive review from earlier this year. The Q5 lacks in a few key areas that many smartphone users on Android or iOS currently take for granted. The rear camera, which is rated at 5MP, is not very sharp, and produces disappointing photos. The camera interface on BB10, which aspires to be as simple as possible, lacks the fine-tuning necessary to ensure a small sensor like this can take decent photos in all lighting conditions. There are no options to adjust exposure, ISO, shutter speed or white balance, and though there are preset “scenes” that purport to optimize photos for certain conditions, I found them to lack efficacy. Similarly, while it is possible to shoot 1080p video, the quality is underwhelming and lacks detail. I found the focus to be finicky and, even with stabilization enabled, the resulting video to be jerky. The front-facing camera, at 2MP, is actually quite good, so there’s that. As stated earlier in the review, the BlackBerry ecosystem just doesn’t measure up to what was promised when the company debuted the OS in January. While they claim to have 75% of the top apps from iOS and Android, developers seem to be cooling to the OS, and many of the top apps haven’t been updated for months, leaving buggy, incomplete and occasionally unusable software. The core OS is very stable, but there is still little that differentiates BlackBerry 10, at least to the end user, from Android and iOS. The gesture-heavy navigation feels immediate and satisfying, but Android is increasingly adopting a similar movement scheme, and iOS 7 is going heavy on the same come this fall. Returning to the hardware, many users are going to compare the build quality and physical keyboard on the Q5 and Q10 and opt to spend the extra $50 to $100 on contract for the more expensive device. 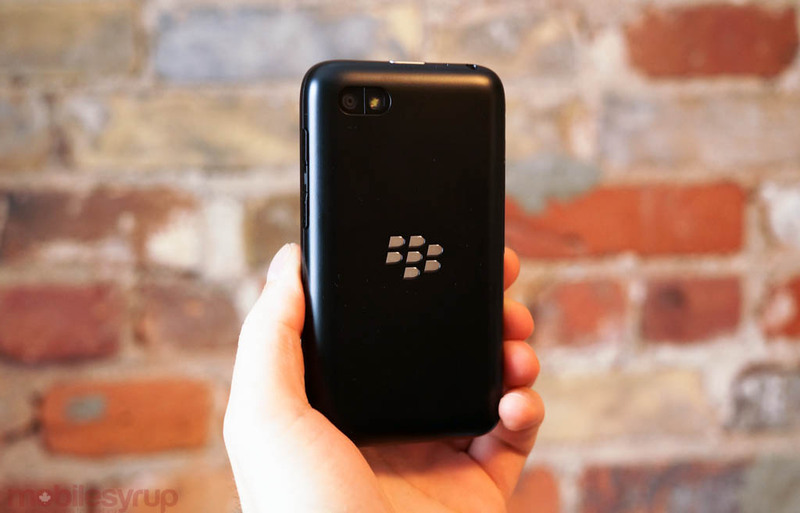 At the same time, users who are currently running late-era BB7 devices like the Bold 9900 or 9780 may not feel the need to upgrade to the Q5, especially if they are primarily used as messaging devices. The built-in social media capabilities are excellent, and far surpass what is possible on BlackBerry 7, but users have be incentivized to upgrade to an Android or iPhone instead of another BlackBerry. I found the plastic backing, which is not removable, to scratch easily, despite being treated well and never dropped. Users would be advised to purchase a case. The BlackBerry Q5 is a strange device, as it doesn’t really fit comfortably in the company’s Canadian lineup. The Z10 is available for around $100 on contract, and the Q10 can be purchased for slightly more depending on carrier and retailer. 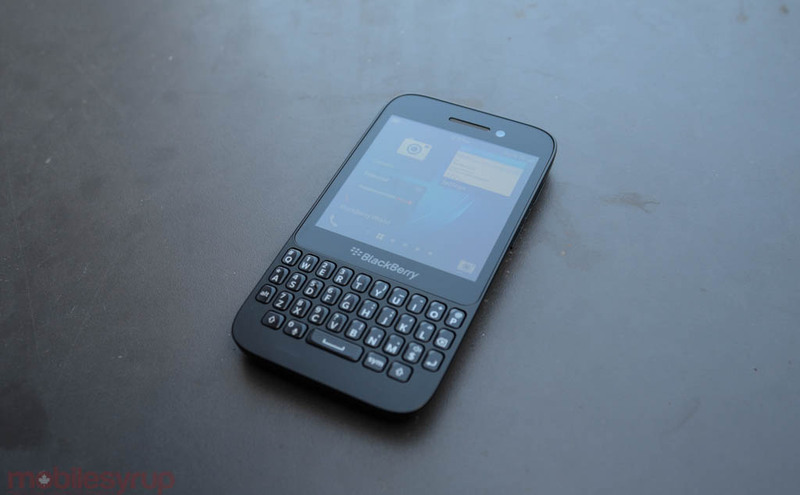 It’s great for first-time smartphone users, and certainly compelling when compared to the outright price of the Q10. But some providers, like TELUS, are pricing the Q5 higher than many mid-range Android phones (at $450, for example, it is pricier than the Nexus 4), putting it out of reach of many off-contract buyers. With all the talk of selling or going private, and the impending release of BBM for iOS and Android, BlackBerry’s core competencies are quickly diminishing. That the Q5 is an LTE-capable device is fantastic, but it also requires a larger data bucket to accommodate the wider pipe; this isn’t your grandfather’s compressed BIS network. The Q5 does more things right than wrong, and is recommended to anyone needing a hardware QWERTY device who doesn’t want to spend more than the bare minimum.